Ernest is a bear that lives on the outskirts of the city. Celestine is a mouse that lives with other mice under the city. Mice and bears don’t mix well, but when Celestine helps Ernest and gets cast out of the sewers, they both become fugitives and have to rely on each other and overcome their prejudices. Based on a series of children’s books by Belgian author and illustrator Gabrielle Vincent, this movie is adorable. Created in a simplified hand-drawn animation style, it immediately grabs your attention with its minimalistic visuals, while at the same time painting the screen like a beautiful watercolor painting. The characters are cute and friendly for the most part. Ernest and Celestine are both endearing characters, although the secondary characters can feel two-dimensional. That’s not necessarily a bad thing with this kind of movie. The other characters are supposed to be somewhat villainous, or at least closed-minded, afterall, and it is a movie whose primary audience is children. While the plot is simple and its moral basic, it’s still a great film for children and their parents. Overall, the message this movie contains is to avoid prejudices and that friends can be found in the most unlikely places. All around, it’s a great movie for kids and adults alike with a great mix of humor for all ages, and an ultimately life-affirming lesson. Highly recommended if you can find it. 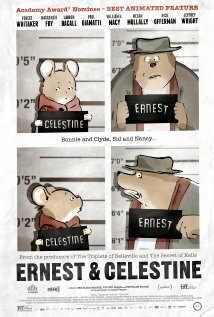 “Ernest & Celestine” earns 4 out of 5 stars. This entry was posted in Movie Reviews and tagged academy awards 2014, ernest and celestine, movie review, oscars 2014. Bookmark the permalink.